How Do Machine Skates Work? Machine Skates or sometimes referred to as Load Moving Skates are very easy to operate, they work by distributing the weight of the load up to 100 Tonnes over the surface of the skate, underneath the skates surface there are specially engineered castors or ball bearings that allow the skate to move and with some models, turn. Most people use Toe Jacks or a Roller Crow Bar to lift the load or machine enough to slide a skate into place. Once the skate is in place the Jack or Crow Bar is lowered in order to release the load on to the skate for ease of transport. Most loads require three skates, two rear skates that connect via a bar to ensure they remain in line with each other and one front steerable skate which includes special steerable wheels to enable the load to travel around corners and be more manoeuvrable. 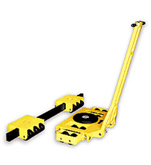 Machine Skates are used in a variety of other load moving applications such as for loading containers, machine movers can also move pallets and pallet boxes that are too heavy for standard pallet trucks! This entry was posted in Equipment Guides and tagged blog, crow bar, equipment, gear, handling, how does it work, how it works, jack, jacks, lifting equipment, load moving, machine skates, Material Handling, news, rigging, toe jacks, transport, transportation, update. Bookmark the permalink. ← Engine Cranes- How Do They Work?